Please refer to our stock # 2047 when inquiring. 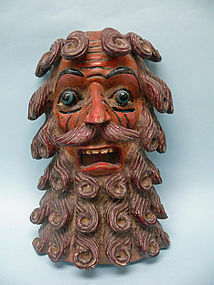 Mexican Wooden "Day of the Dead" Mask, Guerrero Mexico, Early 20th Century, 15 1/2" high. Human form of male with curly hair and beard. Large eyes, sharp nose, white teeth and mouth pursed in expression of fright. Some loss due to age and wear but in great condition. Day of the Dead (Spanish: Día de Muertos) is a Mexican holiday celebrated throughout Mexico and around the world in other cultures. The holiday focuses on gatherings of family and friends to pray for and remember friends and family members who have died. It is particularly celebrated in Mexico, where it is a national holiday, and all banks are closed. The celebration takes place on November 1 and 2, in connection with the Catholic holidays of All Saints' Day and All Souls' Day. Traditions connected with the holiday include building private altars honoring the deceased using sugar skulls, marigolds, and the favorite foods and beverages of the departed and visiting graves with these as gifts. They also leave possessions of the deceased.